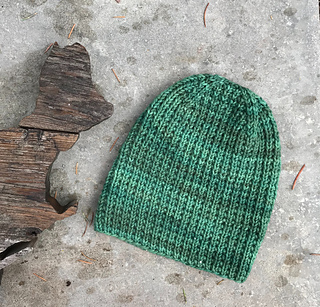 Boon Island is a unisex hat knit in the round from the brim up. Its simple Cracked Rib patterning is easily memorized making it a perfect social project. It can be worn slouchy or beanie-style with the brim folded depending on weather and mood. The tailored decreases give this otherwise casual hat a polished appearance. Boon Island is conveniently written for 4 sizes and all measurements are given in US and metric. Stop by our Ravelry group Polka Dot Sheep Publications for questions, comments or to show off your Boon Island. For subscriber-only news and offers, sign up for our email updates. Show us your Boon Island on Instagram! Yarn: Worsted weight. Shown in PDS Whitefish Worsted. Notions: (4) stitch markers, one of a different color for marking the beginning of round, tape measure, and darning needles for weaving in the ends. If you are between sizes, make the smaller size.